Trump says he will likely meet North Korean leader again, says "a lot of good things are happening" in North Korea. U.S. President Donald Trump said on Monday he would “most likely” meet again with North Korean leader Kim Jong Un. In an interview with the Reuters news agency, Trump said he believed North Korea had taken specific steps toward denuclearization, despite widespread doubts about Kim’s willingness to abandon his arsenal. While insisting that “a lot of good things are happening” with North Korea, Trump complained that China was not helping as much as it had in the past because of its trade dispute with the United States. 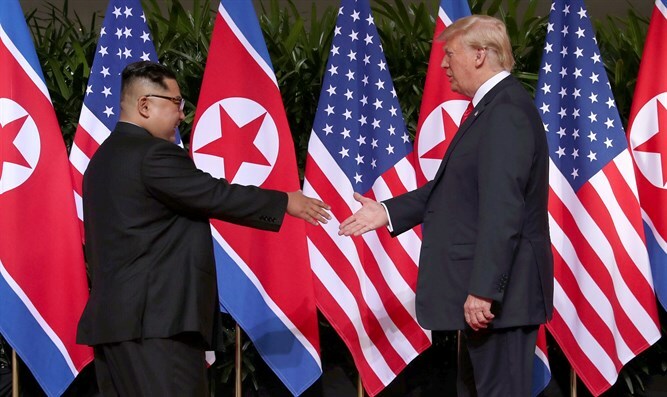 Trump and Kim held a historic summit in Singapore in June, during which they signed an agreement which includes a commitment to achieve total denuclearization of Korea, with promises to pursue “vigorous negotiations” to that end. Subsequent reports suggested that despite its commitment to denuclearize, North Korea has continued to expand infrastructure at nuclear and missile sites. U.S. National Security Advisor John Bolton said two weeks ago that North Korea had not yet taken significant steps to get rid of its nuclear weapons project. Trump later insisted that North Korea is making progress in dismantling its nuclear program. On Monday Trump told Reuters he had only been working on the North Korean issue for three months whereas his predecessors had been working on it for 30 years. “I stopped (North Korea’s) nuclear testing. I stopped (North Korea’s) missile testing. Japan is thrilled. What’s going to happen? Who knows? We’re going to see,” he said. The president credited his “great chemistry” with Kim for easing a nuclear standoff that last year raised fears of a new Korean war. Asked whether another meeting with Kim was on the horizon, Trump said, “It’s most likely we will, but I just don’t want to comment.” He offered no details on the timing or venue.